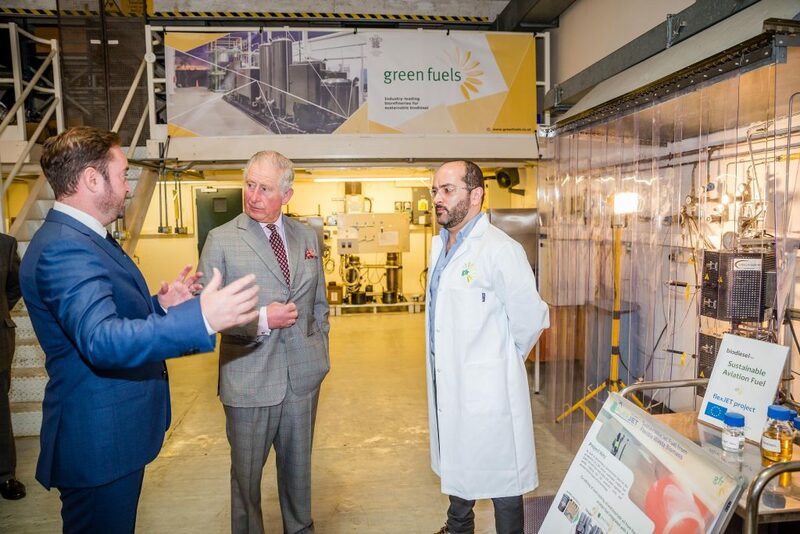 The Prince also heard about Green Fuels’ sustainable biofuel project in Brazil where, with support from the FCO, Green Fuels’ is establishing a localised waste to biofuel project that can be replicated throughout Latin America. “This is an ambitious project that includes reforestation of degraded pasture land and urban waste collection,” said Julian Beach, Business Development Director at Green Fuels. The project is the first stage in a scheme in the southeast region of the Brazilian state of Minas Gerais that will eventually be a £200 million project with the reforestation of 300,000 acres of degraded land, and involving at least 46 municipalities. The visit moved onto the renewable fuel laboratories to learn of projects currently underway at Green Fuels Research (GFR). His Royal Highness saw waste being converted into Sustainable Aviation Fuel (SAF) through GFR’s SABR process. This process is a key component of Project Flexjet which will initially establish a waste to SAF demonstration facility in Germany supplying the airlines such as BA. “The Prince was shown the potential impact of SAF in decarbonising aviation and heard how the UK was leading the way in the processing of waste in this game-changing field” said Dr Sergio Lima, Senior Research Scientist. Project Flexjet has been part funded by the European Union with the aim to catalyse the production of SAF within Europe.